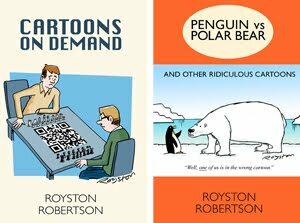 My cartoons have appeared in many places throughout the world, but I must admit I never expected that they would ever be seen in the Antarctic. The South African National Antarctic Expedition asked if they could use a cartoon of mine, which appeared in Reader’s Digest, on their team T-shirt for this year’s trip to Antarctica. ... and this on the back! 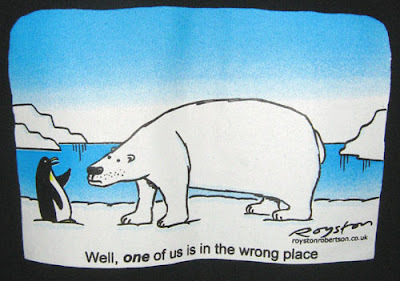 The original wording was “Well, one of us is in the wrong cartoon.” That was fine for a magazine cartoon, as it was really a cartoon about cartoons, which often feature polar bears and penguins in the same place. 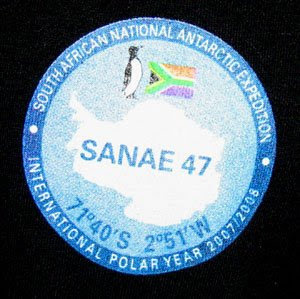 But the SANAE wanted it changed simply to “place”, because they’re often asked by people if they will encounter polar bears during their expeditions. That’s me modelling the shirt in the pics by the way. 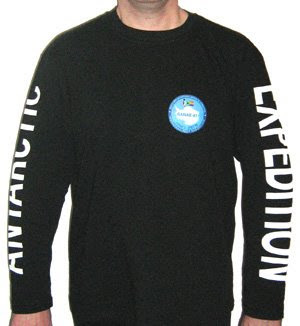 I’ve not worn a long-sleeved T-shirt (well you wouldn’t want a short-sleeved one at the Antarctic, would you ...) since the early 1990s. With the lettering down the sleeve I reckon I could pass for a member of EMF. how'd they find it, cartoonstock? No, they did an internet search and contacted me directly. 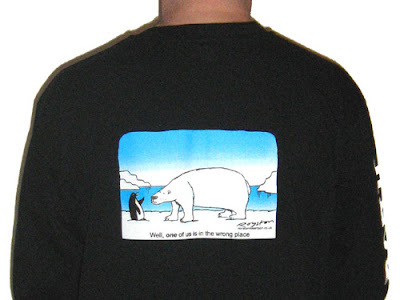 They were looking specifically for something irreverent for the back, and came across the image on my website while looking for cartoons on an Antarctic theme. Very cool picture pardon the pun! Great work!